Ideal for a special occasion, this long sleeves sleepsuit is a great pick for your adorable little one. It features a stunning collar along with bow detail that adds to its look. The closed feet ensures unparalleled comfort and warmth. 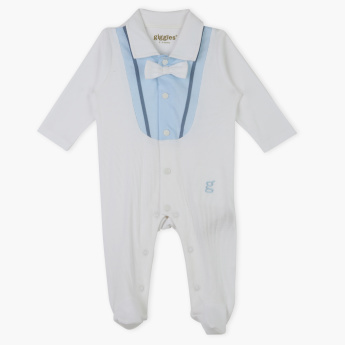 Features : Collar neck closefeet sleepsuit with attached bow tie looks so adorable for special occasion .Pure cotton made for baby's delicated skin.